Tortilla soup has become a standard of tex-mex menus here in the states, becoming another pillar of the glorious international chicken soup pantheon. While its origin is shrouded in mystery, food historians can pinpoint its arrival to America somewhere around the 1890s. The combination of slow simmered chicken, tomatoes, and fried tortillas is a simple blend of flavors that seem as if they were always meant to be together. Crazily, the myriad chicken tortilla soup fails come in the way of people bastardizing this formula, inundating the soup with unnecessary toppings (or worse, using cheese to cover up a watery broth or lack of chicken and vegetables). 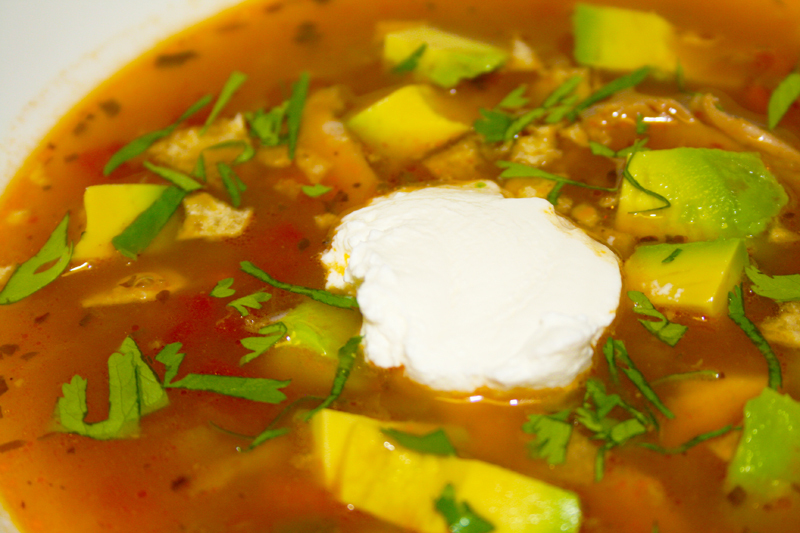 In terms of toppings, the avocado and cilantro are standard, but occasionally I like to add a small bit of sour cream (or Mexican crema if I have it) to add some coolness to the soup. Cheese and crumbled tortillas are also welcome, but just don’t inundate the whole thing with acoutrements. Remember, the chicken is the star of the show, and no one likes to be upstaged. In a large pot, heat the olive oil on high. Add the onions, carrots, garlic and zucchini and cook until onions are translucent. Add the green chiles, chipotle chili and ground cumin and cook for an additional minute. Add the stock, tomatoes and chicken and continue to simmer for about 20-25 minutes or until flavors have combined and the veggies are soft. Ladel the soup into bowls and add the condiments of your choosing.